Our favorite time of year is almost here! It’s time to plan for your spring and summer patio parties that you’ve been dreaming about all winter long. Creative Gifts Direct has some unique gifts and special touches that can bring your food spread to the next level. Check out some of our favorites below. Bring as a hostess gift or, better yet, treat yourself! 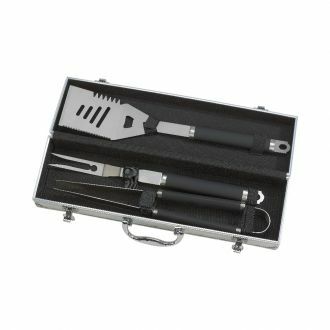 What’s an outdoor party without tools for the “Grill King or Queen?” A new set of stainless steel wood handled tools for outdoor grilling is a must have item. The oversized tools include tongs, a fork, and a spatula. Each piece comes with leather ties for easy hanging on the grill. The carrying case makes it easy to store and protect for the next party. Even if you don’t brew your own beer, this Tasting Flight will make for a fun night trying out the beverages you are offering. The wooden holder has a handle and six circular indents in the wood for the cups to sit in securely. It is both functional and fabulous. Color code your tasting with each finely crafted glass. Serve your signature dessert in these beautiful glasses that come with a miniature spoon to scoop out that last bit of heaven. These 4.75-inch glasses can also double as shot glasses after removing the spoons. Who doesn’t love multifunctional kitchenware? Creative Gifts Direct offers a huge variety of gifts for entertaining, both indoors and out. Check out our hostess gifts and serving platters that can make your tabletop shine during your next event. Pair our items together for a cohesive look and a night your guests won’t soon forget. Check out our options and our newest items on our website. See you at the grill! This entry was posted in Engraving, Gifts, Holidays, Special Events on April 3, 2019 by Creative Gifts.